A quality moose hunt is top priority for many hunters. With their wide palmated antlers, a hunt for a trophy quality moose is one of the most highly sought after hunt. Due to the limited numbers of permits in most moose areas and the difficulty in acquiring them, most moose hunters are waiting many years before completing their dream. Here at HuntersTrailhead we are always looking for ways to provide the moose hunter an opportunity to embark on these hunts without having to wait a lifetime for a permit. Though it is not always possible to acquire a permit easily or cheaply, we have developed strong relationships with outfitters and landowners that are ready to provide the necessary services when a hunter is ready to go moose hunting. 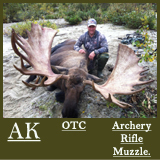 Trophy quality Alaskan moose hunt with very high success rate. This outfitter only takes 2-4 hunters per year insuring top quality and extremely high success. Due to limited hunting this outfitter is able to boast a 95% success rate with an average antler spread of 61". Fully guided Canadian moose hunts with guaranteed permits. Hunt from the main lodge or from one of multiple camps set away from the lodge are available. Hunt via ATV's, 4x4's or boat. What ever your preference, this outfitter has the hunt that fits your objectives. Trophy quality shiras moose. Wilderness horseback hunt with high success. Fairly easy to draw tags. High success Canadian moose hunts on 110,000 acres of private reservation land in central Saskatchewan. Outfitter is able to boast a 100% success for the past 5-years. Hunts are booked during the rut in September. Guaranteed landowner tags available on multiple large private ranches. Fully guided and outfitted with comfortable lodging accommodations. Giant Alaska-Yukon moose on 5 million acres of exclusive hunting territory. All hunts will include tags for grizzly bear and mountain caribou that can be taken on a trophy fee basis.